Earth is not the only place in the solar system with volcanoes! A NASA spacecraft’s first flyby of Mercury has yielded a wealth of information about the inner-most planet, some of which confirms volcanism occurred there, settling a longstanding debate. MESSENGER images of the Caloris basin, the youngest known impact basin on Mercury, showed smaller craters within the impact basin that had been in-filled with material, “and if you had impact melt [as with the lunar breccia], that wouldn’t happen,” explained Scott Murchie, a co-investigator for the Mercury Dual Imaging System (MDIS), of Johns Hopkins University. Read the full story on Space.Com!! Click here for a more scholarly articles on Mercury volcanism. Second, Venus shows no evidence for plate tectonics . There are no long, linear volcano chains. There are no clear subduction zones. Although rifts are common, none look like the mid-ocean ridges on Earth. Also, continent-like regions are rare, and show none of the jigsaw fits seen on Earth. Thus, where volcanism on Earth mostly marks plate boundaries and plate movements, volcanism on Venus is much more regional and much less organized. Third, volcanism on Venus shows fewer eruptive styles than on the Earth. Almost all volcanism on Venus seems to involve fluid lava flows. There is no sign of explosive, ash -forming eruptions on Venus, and little evidence for the eruption of sludgy, viscous lavas. This may reflect a combination of several effects. First, due to the high air pressure, venusian lavas need much higher gas contents than Earth lavas to erupt explosively. Second, the main gas driving lava explosions on Earth is water, which is in very short supply on Venus. Lastly, many viscous lavas and explosive eruptions on Earth occur near plate subduction zones. Thus, the lack of subduction zones should also reduce the likelihood of such eruptions on Venus. These large shields all look much like shield volcanoes on Earth. They are mostly covered by long, radial lava flows. They all have very gentle slopes. And most also have some form of central vent or summit caldera . Thus, we think that these shields forme d from basalts, much like the shield volcanoes in Hawaii. The venusian shields, however, show a map pattern which is quite different from that seen on Earth (see reference map). Namely, the shields on Venus are widely scattered, and they show no linear vo lcano chains like those on Earth. This suggests that Venus does not have active plate tectonics , and also that most volcanism on Venus is related to mantle hotspots. Large liquid lava flows are thought to form three types of feature on Venus. The first are large, flood-like lava flow fields or fluctus. The second are long lava channels. And the third are large calderas that have no clear shields or cones. None of these features are common on Venus, but they are still plentiful and several large examples of each type are known. The map above shows the locations of some 53 lava flood fields. These flow fields are mostly 100 to 700 km long, but the longest are over 1000 km in length. Their widths are variable, but can reach over 300 km. In size, they are thus much like lava flood basalts on the Earth, and like the youngest mare flows on the Moon. They mostly lie near the edges of the lowland plains, and flow down into these plains. A few are located near younger large shields, but many lie at some distance from the largest shield volcanoes. It is thought that these flows may have formed near the end of plains formation . In all nearly 200 channels have been found on Venus. Many of these channels lie in the lava flood fields or on other volcanoes. Still, nearly 50 lava channels have been found which do not lie on a larger lava flow. These channels are usually 0.5 to 1.5 km wide, but they range widely in length. Most are less than 400 km long, but some are over 700 km long. One is longer than every other known lava channel in the solar system. With a length of about 6800 km (~4200 miles), this one channel is even longer than the Nile River on Earth. Like the Lava Flood Fields, most lava channels start near the edges of the lowland plains. Many are also found near coronas or in large groups. In general, the lava channels on Venus look much like sinuous rilles on the Moon. The longest channels, however, are not quite the same. First, they tend to be straighter and wider than the lunar rilles. Second, some show older branches and cut-off loops like those in large rivers on Earth. This suggests that some of these channels may have formed over a long time from one or more eruptions. The last features mapped here mark sites from which large volumes of lava are believed to have erupted. These calderas are large, round to oval pits that have steep walls but very low rims. They are often surrounded by a ring of faults or graben . Calderas are thought to form when the ground falls in over an emptied, shallow magma chamber . Although part of many shield volcanoes, 86 calderas have also been found on Venus which are not. Most of these calderas are between 40 and 80 km in size, but the largest are nearly 200 km across. Most are near the shields of Atla and Beta Regio, but a few also lie in the high plains of Lakshmi Planum. Almost no calderas are found in the lowland plains. This lack suggests that shallow magma chambers did not form in the lowlands. If this is true, then lavas must have risen straight to the surface there. Thus, the lavas would have little chance to pool together or to build up in a single area over time. This could explain both plains formation and the small sizes of the lowland shields. In the highlands, however, we find both calderas and large shields. Thus, shallow magma chambers could form higher up. This change in volcanism with height is thought to be an effect of air pressure. In the lowlands, air pressures are very high, nearly 100 times those on Earth. Thus, lowland lavas are much like seafloor lavas on Earth. They are very dense and contain almost no gas bubbles. In the highlands, air pressures are lower, and this lets some gas bubbles form on eruption. This makes highland rocks less dense and can allow lavas to pool below the surface. If the lavas pool in one place over many eruptions, then a large shield can be built up over time. However, no such build up can occur if the pool does not fill up again after the eruptions. Instead, a caldera should form like those mapped here. Volcanism is also part of some very complex features on Venus. These features mix both lavas and faulting; thus, they are called TECTONO-VOLCANIC structures. They differ from volcanoes in two ways. First, volcanoes often form on older rifts or faults, but they do not cause this faulting. Second, most volcanoes are just large piles of lava. In contrast, the tectono-volcanic structures are thought to form by faulting over rising magmas. Also, lavas make up only a small part of these structures. Due to differences in faulting, three types are found on Venus. Some 200 to 300 coronas are known, of which 175 are mapped above. These are large, round to oval shaped features with a distinct ring of faults or ridges. They often have a flat, raised or down-dropped center and an outer moat-like trough. Lava plains and small shields are found in both the centers and the moats, and pancake domes are very common as well. Coronas range in size from about 100 km to nearly 1000 km, but most are 200 to 250 km across. Coronas are thought to form over small mantle plumes. First, rising magmas and heat lift the surface. These plumes also feed local eruptions, but they are too small for a long string of eruptions. Thus, the uplifted surface is not fully buried, and a complex mix of faults and lavas is formed. With later cooling, the uplift then sinks to yield the down-dropped centers seen in the oldest coronas. Arachnoids are smaller cousins of the coronas. Like coronas, they have a round ring of faults or ridges, but these rings lie inside a set of radial ridges. The rings range from about 50 km to 200 km in size, with the outer ridges running out another 200 to 400 km. Over 250 arachnoids have been mapped, and they tend to cluster near both coronas and other arachnoids. Also, like the coronas, arachnoids are rarely found in the lowest plains. Instead, most lie just above the lowland plains (i.e., the green map areas). Arachnoids look like coronas and form near coronas. Thus, they are thought to form in much the same way as coronas. They are smaller than most coronas, however, and they tend to show fewer lavas. Thus, they probably formed over smaller plumes. Since smaller plumes should have less magma and should cause less uplift, this model seems to fit the facts. However, the lack of lava flows also suggests that there are more intrusions in arachnoids than in coronas. Indeed, it has been suggested that the radial ridges may be large dikes. In this case, these dikes could drain magmas away from the plume and limit the eruption of lavas at the surface. Novas show fewer signs of real volcanism than the coronas or the arachnoids. Instead, they show a starburst-like pattern of faults and a broad, dome - like uplift. Some of these faults seem to feed lava flows, but such flows are not common. About 50 Novas have been mapped, with sizes ranging from about 50 km to 300 km. Most are between 150 and 200 km across, and thus are the same size as many of the arachnoids. Although rare, novas tend to occur near large volcanoes or near groups of coronas and arachnoids. They are seldom found alone or in the lowland plains. Since the higher plains on Venus are thought to lie over mantle plumes, this suggests that novas are linked to mantle melting in some way. Given their size and shape, they may mark an early stage of uplift over small mantle plumes. If this is true, then these novas may turn into arachnoids or coronas in a few million years. Mylitta Fluctus is one of the largest lava flow fields on Venus. It is about 1000 km long (600 miles) by 460 km wide. Thus, it covers an area slightly larger than the state of Arizona (300,000 square km). It lies on the southern edge of Lavinia Planitia, and drops some 2000 meters from south to north. Note the large crater which is partly flooded in the southeast (arrows). This flow field contains many lava flows. These vary in length from 400 to 1000 km, and form ~30 km to 100 km in width. Many of these flows contain central lava channels like those seen on Hawaii. The flows seem to have formed in 6 separate eruptions, and most come from a single center in the southeast (marked source). This source is a large shield volcano that was formed by the first eruption event. The later eruptions then produced the longer flows of the main flow field. On the basis of Earth lavas, it is thought that the shield formed in about 10 to 70 years. Each of the later lava flow sets could have formed in less than 2 to 80 days. Note: While Flood Basalts on the Earth are as large as Mylitta Fluctus, most Flood Basalts do not come from a single source. Rather, they come out of long fissures which are buried by the erupted lavas. Thus, the flow of lavas away from the shield here suggests that it may be harder for lavas to reach the surface on Venus. Since the shield lies on a major rift zone , faulting may have helped these lavas reach the surface. This image shows another lava flood field. This one lies on the edge of Atla Regio, and is also about 1000 km long. At its widest, it is nearly 300 km across, but it also narrows down less than 50 km in some places. In area, it is roughly the same size as state of Oklahoma (~180,000 square km). Like Mylitta Fluctus, this flow field formed in several stages. Here, however, there is no shield volcano at the source. Rather, the lavas erupted four times from a small group of faults and graben . Like Mylitta, these faults are part of a larger rift system . After eruption, the lavas then flowed west along the edge of Atla Regio. Note how they arc around to follow the lowest ground, and then flow into a smaller rift. This is one part of a long lava channel in Helen Planitia. In all, the channel has a total length of almost 1200 km, but the segment shown here is only 200 km long. It is also about 2 km wide. Note how the channel snakes along in a band that is slightly brighter than the surrounding plains. This band probably formed from thin lavas that flowed over the channel's banks. In addition, a much older lava channel can also be seen. The marked pair of bright lines (arrows) seems to mark a channel that has almost totally faded away into the nearby plains. Although well preserved, the main channel also seems to be old. First, its ends fade away into the plains lavas. This suggests that the channel has been buried in places by younger lavas. Second, the channel is cut by a swarm of ridges and faults (see upper center). Probably, the channel formed soon after the local plains, and both then saw nearly 300 million years of slow deformation. This is part of another lava channel. It lies just south of Ishtar Terra, and also is about 2 km wide. It clearly shows a set of cut-off channels and islands that look much like those seen on some Earth rivers. Thus, it seems that the lavas changed their path over time much like EarthUs rivers. Clear signs of erosion are also seen inside the channel in the upper right. Thus, it looks as if the lavas cut down into older flows. These changes in the flow path are likely the result of later lava flows using an older channel. Still, they might also have formed during one very long eruption. Venusian channels also form more complex systems. Here, we see one part of such a system. In the upper left are several channels that formed when lavas spilled out of a fault-bounded trough. These channels merge in the center of the image, and then run into a ridge of highlands. The lavas pooled behind this ridge, before spilling over it too to flow further east. In the process, they carved deep outlets through the highlands (see arrows) and left a number of stream-lined islands. These islands, at both the left and right, look much like features carved by large floods on the Earth and on Mars. Thus, it is thought that the lavas in this channel behaved much like flood waters on the Earth. Given the slow speed of most Earth lavas, this in turn suggests that the lavas were not basalts. Rather, they may have been very hot mantle melts (komatiites), or possibly liquid sulfur. For reference, this image is about 250 km wide. It shows part of a 1200 km long channel which flows around the Ammavaru volcanic complex . It lies in the south near Lada Terra. This image shows shorter sinuous rilles more like those seen on the Moon. Here, the smallest rilles begin at small or middle-sized round pits. The larger rilles begin at bigger, more complex collapse zones. Note how the rilles narrow away from these sources. This suggests that the lavas slowed and cooled as they moved away from the source vent. Thus, these eruptions were likely smaller and more short lived than the eruptions that formed longer lava channels. Also note how the source pits line up with the older faults in this image. Once again, these faults probably helped control where the lavas could reach the surface. This caldera shows what most calderas on Venus look like. The central hole is about 36 km across, and it is surrounded by a large set of arcuate faults. These form a bulls-eye pattern over 100 km across. Note that these faults also cut a ring of lava flows that formed before the caldera fell in. Inside the caldera, the floor is made of dark, smooth lavas that erupted after collapse. Even after these lavas, however, the floor still rose and fell a few more times. This is shown by the ring of faults inside the floor and by the faults at the caldera's center. Impact craters also are round holes, but most craters and calderas do not look alike. First, impact craters almost never have a bulls-eye of faults outside their rims. Second, where most impact craters have sharp, raised rims, most calderas have low, rounded rims like that seen here. Third, most impact craters of this size have a clear peak rising out of the crater floor. Calderas mostly have smooth floors. Lastly, calderas often have clear lava flows on either their rims or floors. Impact craters rarely show such signs of volcanism. Sacajawea is one of the largest calderas on Venus. It is roughly 150 km long by 100 km wide, and it seems to be over 1000 m deep. It lies on the high plains of Lakshmi Planum. Again, we see a large ring of fractures outside the caldera, and a smooth lava floor inside the caldera. Some of the floor lavas even bury the ring fractures in the left center. Also note how the fractures are blurred north of the caldera. This may be a region where thin lava flows have buried the older ring faults as well. A number of small domes and shields are also found in this area, and on the southeast rim. All these features suggest that Sacajawea formed from many eruption events. Indeed, Sacajawea sits on a broad (~600 km wide), low rise that may be a very flat shield-like volcano. This image shows a small, fairly simple corona. This corona has two parts. There is a central plains region roughly 150 km across, and an outer fracture ring about 45 km wide. The central plains stand slightly higher than the outside plains, while the fracture ring seems to lie in a slight trough. There are also many signs of volcanism in the area. For instance, three pancake domes lie close to the fault ring (1,2,3). There is also a string of small shields along the bottom of the image (5). And the fault ring itself is buried by plains lavas in several places (arrows). All the pancake domes are cut by some ring faults, as are the younger plains. Thus, the corona was still forming when these lavas were erupted. This mix of major faulting and volcanism is why coronas are called tectono-volcanic features. Note: there is a fourth round feature in this corona that is not a pancake dome. Rather, its edge is a set of concentric faults that seem to have formed around a central uplift. Possibly, this marks deformation over a magma intrusion. Or maybe it is somehow related to the faulting in the outer ring. Idem-Kuva is about 230 km across, and is a more complex corona. It lies just north of Gula Mons, and it shows a multi-ringed plan. At the center is a large plateau, about 100 km wide and 600 m high. This looks somewhat like a pancake dome, but it is much bigger. It probably formed by heating and uplift rather than by eruption. On the edge of the central high are two arcuate troughs, and these are bounded in turn by a partial ring of faults. These faults may have once ringed the entire feature, but they seem to be buried on the north by younger plains lavas. Two long, bright lava flows also run north out of the troughs and over the fault ring. These flows are about 150 and 350 km long, and they mark the clearest signs of volcanism in Idem-Kuva. This image also shows two other features. First, there is a major line of faults running northwards into Idem-Kuva (arrows). These faults are part of a rift zone on Gula Mons, and they may have fed the two lava flows seen in Idem-Kuva. Second, the pale circle in the upper left marks an older volcanic center (Nissaba). This volcano is fairly large but very flat. It is 300 km long by 200 km wide, but it is only about 400 m high. Note how the leftmost flow out of Idem-Kuva curves around its base. This suggests that Nissaba formed before the flow. It may even have formed before Idem-Kuva. Many coronas lie in groups or chains. Here, we see one such grouping of 4 or 5 coronas about 200 to 250 km across. It is part of a much longer chain over 4000 km long. The coronas overlap in places, but they are also linked by a number of bright faultlines. These faults are part of a major rift zone, Parga Chasma, that seems to have helped the coronas form. Indeed, the Parga rift has the highest density of coronas to be found on Venus. It also runs into Atla Regio and may have helped to feed the large shields found in that region. Thus, while rifts can bring lavas to the surface, this rift may also lie over a line of deeper mantle melting and uplift. This arachnoid lies in the plains northwest of Atla Regio. Like a Corona, it has a clear fault ring and a central (mostly) smooth region. Unlike a Corona, it also has a set of radial ridges which arc away from the fault ring. It is also much smaller than most coronas. In this case, the fault ring is about 95 km across, and most arachnoids are about the same size. In contrast, most coronas are over 200 km across. Still, outside the fault ring, the ridges seem to run 100 to 200 km before merging with other ridge systems. Most arachnoids show few signs of volcanism. Here, there are a few small shields in the center, but the plains lavas show the clearest signs of volcanism. Note the bright lava flows on the northwest and southeast that seem to come out of the fault ring. Also note how the dark plains arc above the arachnoid, and how they ring the crater in the bottom center (arrows). These all suggest that many large, thin lava flows were erupted as the arachnoid was forming. Arachnoids often lie in faulted plains, and their outer ridges tend to turn into regional patterns. Thus, they often look like spiders on a bright web. Indeed, the name Arachnoid means Rspider-likeS. Here, we see two arachnoids in a faulted plains region (A and B). These features are each about 120 km across, with an outer ring of ridges maybe 150 km wide. Again, there is little sign of volcanism. Only a few bright lava flows are seen in the upper left. A third feature (C) may also be an arachnoid. However, it has only a few radial ridges, and it also shows a caldera-like pattern of nested cliffs. Thus, it is harder to classify. The edge of a larger corona (arrows) also can be seen at the top of the image. Unlike Coronas and Arachnoids, Novas do not have major ring features. Rather, they show a striking starburst of faults and graben. Also, there is often a clear rise at the center of these faults. This example is some 250 km across, and it lies in Themis Regio. There is no clear sign of volcanism, but a few small lava flows may run out from faults in the upper left and upper right. Still, there is a lot of volcanism nearby. Namely, this nova lies within a very long chain of coronas. Indeed, it lies just above the corona chain image in Parga Chasma. Novas mostly occur next to large shields or major corona chains. Thus, they seem to be volcanic. They probably mark an early stage of uplift and faulting that could later become a corona or a large shield volcano. This image may show the future of other novas on Venus. It shows a complex volcano with several clear parts. Its raised center has a clear starburst of nova-like faults. Around this nova is a partial ring of corona-like faults (arrows). Then, outside the corona, is a broad apron of thin bright lava flows. These flows lie on darker lavas which, in turn, clearly bury a much older area of heavily faulted lowlands. In all, the outer lava flows mark the start of a shield volcano some 450 km long by 350 km wide. The central nova itself is about 150 km across. Maybe, in 10 or 50 million years, more flows will finally bury the central nova to make a shield looking like Ushas Mons. This image shows three of the venusian pancake domes. They lie near the equator on the edge of Eistla Regio. The two larger domes are roughly 65 km (40 miles) wide, and the smaller dome is about 22 km (13 miles) wide. All three are very low, rising less than 1 km above the surrounding plains. The tops are fairly flat to slightly bowl-shaped, and they show clear patterns of small cracks and faults. Most of these cracks probably formed with the dome, but some may have formed later with the faults in the surrounding plains. Note how some features extend from plains onto the edges of the central and right hand domes (arrows). This image shows a chain of pancake domes east of Alpha Regio. Each dome is roughly 25 km (15 miles) wide, and the highest are about 750 m tall. As in Eistla Regio, most of these domes show a (very) small central pit. Here, however, we see a variety of crack patterns on the domes. These probably mark small changes in the speed or conditions of eruption. Many of the domes here also overlap. Such overlaps are quite common, and most seem to mark a series of dome eruptions. In some cases, however, they may mark two domes that formed at the same time. (Magellan Press Release Image P-37125). This feature is called the "Tick" for obvious reasons. It lies near the edge of Eistla Regio and is roughly 66 km (41 miles) across. The central round "body," however, is only about 35 km (22 miles) wide. Like the pancake domes, the ticks are broad, mostly flat features, and they often have a central pit or vent structure. The difference is that the ticks are surrounded by an array of short, radial ridges. In this case, the "head" of the tick is defined by a set of small collapse pits. This strange volcano lies in Aino Planitia. Its central dome is roughly 100 km across, but it is only about 1 km high. Around the dome are several thick, fan-shaped lava flows and a much larger flow with a banded surface. These flows strongly suggest the eruption of very viscous lavas. First, the fan-shaped flow lobes are very thick. The measured flow heights vary between 120 and 540 m (~400 to 1700 feet). Second, the shape of these flows suggests that the lavas had a hard time flowing away from the volcano. Third, while the larger flow is much thinner, it looks a lot like the banded flows produced by viscous lavas on Earth. Viscous lavas on Earth are rarely basalts. Hence, this volcano may mark a rare case of non-basaltic lavas on Venus. Such lavas need a lot of water to form, however, while water is scarce on Venus. Further, basalts can also form viscous lava flows in some cases. Thus, it is not yet clear what the nature of these lavas was. (Magellan Press Release Image P-39916, JPL image MGN-93). Mars has the largest shield volcanoes in the solar system. It also has a wide range of other volcanic features. These include large volcanic cones, unusual patera structures, mare-like volcanic plains, and a number of other smaller features. However, volcanic features are not common. There are less than 20 named volcanoes on Mars, and only 5 of these are giant shields. Also, volcanism occurs mostly within three regions. Even the mare-like plains cluster near these regions. The main cluster of volcanoes and lavas is in Tharsis. A much smaller cluster of three volcanoes lies in Elysium. Lastly, a few paterae are near the Hellas impact basin. Like the Moon, volcanism on Mars is very old. The mare-like plains on Mars are the same age as the lunar mare, roughly 3 to 3.5 billion years old. However, volcanism lasted much longer on Mars than on the Moon. It also seems to have changed over time. Volcanism in the highland paterae and mare-like plains on Mars stopped 3 billion years ago, but some of the smaller shields and cones erupted only 2 billion years ago. The giant shield volcanoes are even younger. These volcanoes formed between 1 and 2 billion years ago. The youngest lava flows on Olympus Mons are only 20 to 200 million years old. These flows are very small, however, and they probably represent the last gasp of martian volcanism. Thus, the odds of finding an active volcano on Mars today are very small. Like the Moon, Mars shows no sign of plate tectonics . It has no long mountain chains, and there is no clear global pattern to the volcanism. Over half of Mars is heavily cratered like the lunar farside. Unlike the Moon, however, most martian volcanism lies outside large impact basins. Instead, the mare-like plains are mostly near the largest volcanoes. These plains also are not limited to the lowest elevations. Indeed, some lava plains are much higher than the cratered uplands. Lava plains may lie at lower elevations as well. However, thick layers of dust and sediment cover both the Northern Lowlands and the large basin floors. These layers reflect a long history of winds, glaciers and flood events. They also hide any volcanism that may have occurred in the low areas on Mars. The concentration and duration of volcanism into these two regions are attributed to the evolution of a long-lived mantle hotspot. More Mars Volcano Information can be found at the "Geology of Mars" website curated by Albert T. Hsui, University of Illinois at Urbana-Champaign. The giant shield volcanoes on Mars are truly huge. The largest are three times as high as the biggest Earth volcanoes. They also are bigger in diameter. Thus, the biggest volcano on Mars is comparable to a pile of nearly 100 Hawaiian volcanoes. Despite this difference in size, the Mars shields look a lot like shield volcanoes on Earth. Both have the same broad flat profiles, large central calderas, and similar lava flow features. The giant martian shields are also much older than any Earth volcano. The youngest lavas on the martian shields are about 20 to 200 million years old. The oldest lavas are near 2.5 billion years old. Thus, these giant volcanoes were active for billions of years. This may explain their large size. On Earth, plate tectonics is always moving volcanoes away from their magma sources. Such movements are very slow, but they mean that most Earth volcanoes have distinct lifetimes. In the Hawaiian islands, for instance, volcanism lasts fo only a few million years on any given island. In contrast, the lack of plate tectonics on Mars allowed volcanoes to just keep growing. The only limit on their final size was the volume of lavas available. This picture clearly shows how large and flat Olympus Mons is. Although the volcano is nearly 27 km high, it is over 20 times wider than it is tall. Thus, most of the volcano has a fairly gentle surface slope. The image also shows the distinct cliff which marks the base of Olympus Mons. In places, this scarp is up to 6 km high. In other places, it is hidden under lava flows cascading out into the surrounding lava plains. This cliff is unique among the giant shield volcanoes on Mars. The rough, crinkly patches around Olympus Mons are also unusual. They form the Olympus Mons Aureole. Both the Aureole and the basal cliff are poorly understood. However, their origins may be related. In one theory, the basal cliff was formed by many large landslides. The Aureole marks material piled up at the bottom of these landslides. This image provides a perspective view of Olympus Mons. North is to the left of the image. Note the clear basal cliff and the gentle rolling slopes higher up the volcano. The faint radial texture above the basal cliff marks the traces of thousands of separate lava flows. To the left and lower right, we can also see places where lavas have flowed over the basal cliff. Mars has a number of volcanoes with diameters between 50 and 150 km. These volcanoes are thus the same size as many large Earth volcanoes. Most are found within the Tharsis and Elysium regions. However, they are all older than the giant shield volcanoes. Thus, many have been partly buried by younger lavas. These volcanoes are divided into two general types. The first type are called "paterae," after the Greek word for a shallow saucer or bowl. They are fairly flat, they generally have little relief , and they often have large calderas. The second class of volcanoes are called "tholi." These volcanoes have much steeper sides, and they typically are taller than the patera structures. Both types apparently formed mostly from basaltic lava flows. Thus, they are much like Earth shield volcanoes. Their different appearances may mark either different depths of burial or changes in the nature of volcanism. The highland paterae on Mars are unique. First, they are not part of the volcanoes in Tharsis and Elysium. They mostly lie in the Cratered Uplands far from other large volcanoes. They also are much older than the Tharsis and Elysium shields. Second, these paterae do not look like Earth volcanoes. There is no sign of actual lava flows. Rather, their central calderas are surrounded by sets of radial furrows. Third, these volcanoes are very flat. They typically are only 1-2 km high and 200-300 km across. These volcanoes are sometimes called ash shields. They seem to be (thin) piles of easily eroded volcanic ash. In contrast to the Earth, however, this ash seems to be composed of basalt . It probably formed when magmas met underground water and exploded into ash and steam. Such explosions help to explain the low height of these paterae. First, large ash eruptions tend to trap air beneath the ash clouds. This air helps support the ash and lets it spread out over wide areas. Second, Mars' gravity is about 1/3 the Earth's. Thus, an eruption on Mars can also carry ash much further than on the Earth. Alba is not a true highland patera, but it is also unique. It is the largest volcano on Mars, and is roughly 1600 km across. Despite its size, however, it is very flat. Alba has a total height of only ~3 km. Alba differs from both the giant martian shields and the highland paterae. Unlike the paterae, there are no signs of any furrowed ash deposits. Also, it is not in the highlands. Rather, it lies north of the Tharsis Volcanoes. Unlike the giant shields, Alba's volcanism is incredibly widespread. Its lava flows look like those on the other shields, but they are not piled as deeply. Also, it sits on a major fault trend that runs north northwards from the Tharsis region. As shown here, the youngest of these faults curve around to neatly frame Alba's summit. Alba also shows a long history of very fluid volcanism. There are both large sheets of mare-like lava flows and hundreds of long, narrow flows with a central channel or lava tube . Most of these flows are over 100 km long, and some are well over 300 km in length. Many are nearly 10 times larger than Earth flows which look similar. This increase in size probably marks larger and longer eruptions than those on the Earth. However, it may also need more liquid lavas than those on Earth. Amphitrite (AP) also lies on the edge of the Hellas basin. However, it is on the far side from Hadriaca. Although larger, it is also less striking in appearance than Hadriaca. The central ring structure is about 120 km in diameter. The furrowed ash shield is about 300 km across. It seems fairly thin, and it has little apparent relief . Like Tyrrhena Patera, it is located in a large unit of mare-like plains. Little else is known about the volcano. NOTE: The circular feature PP may also be a highland patera. However, it shows no sign of any furrowed ash units. Thus, it may just be a large impact that was partly buried by plains lavas. 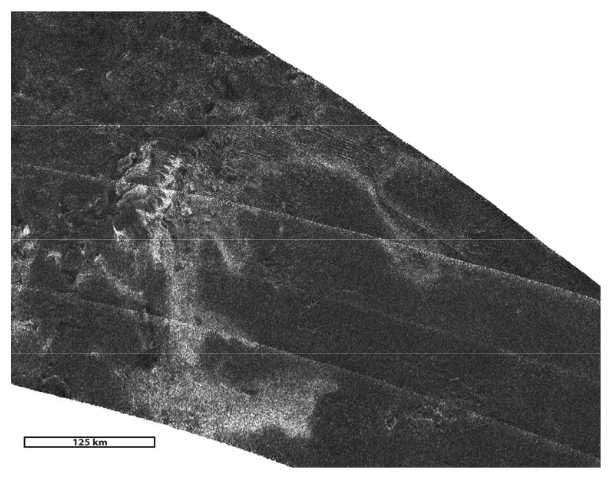 (Viking orbiter images 94A74, 94A75, & 94A76, from Tanaka & Leonard (1995) J. Geophys. Res., v. 100). Hadriaca is younger than Tyrrhena Patera. It is also larger and better preserved. The caldera in the upper left is nearly 60 km across. The furrowed deposits extend off the image to the lower left for over 300 km. However, they extend less than 100 km in the other directions. This is because Hadriaca lies on the edge of a large impact basin, and has mostly flowed down the side of this basin. It has a very low relief as well. Ignoring the slope into Hellas, it is only 1-2 km tall. This volcano also is linked to clear signs of martian ground water. It lies near the sources for a major martian outflow or flood channel. Several of these sources are seen to the right here as large, smooth-floored depressions. These features indicate that a lot of water or ice was buried near the volcano. Tyrrhena is the most striking of the highland paterae. It is about 300 km across, and it has a total relief of about 2 km. The central caldera is 12 km across, but it lies within a larger ring of fractures. This fracture ring may mark an older, buried caldera. It is 45 km in diameter, and it encircles the whole summit. The most striking features, however, are the broad furrows that run away from the fracture ring. These furrows are up to 200 km in length, and they suggest a period of heavy erosion. This erosion is very old and likely dates back to the time of volcano growth. It may mark a time of strong hydrothermal activity. Note that the furrows east of the summit are buried by a smoother set of volcanic deposits. Most of the extruded lava ended up forming the vast volcanic plains on Mars. About 60% of the Martian surface is covered by plains. Unlike the Moon or Mercury, one cannot definitively conclude that these are volcanic plains because they could be alluvial plains formed by hydro-processes or dust deposit plains formed by aeolian processes. One way to identify volcanic plains is by lava flow fronts. In this photo, one can see the advancing lava that filled a couple of ancient craters. Also note the smoothness of the lava plain and the rough ancient surface. This image shows the front of a lava flow advancing from the upper right hand corner. The rough, parallel ridges are probably the cooler upper portion of the flow that crumpled as the flow advanced. The front formed a cliff of about 30 meters (100 ft) high. Light-colored dust particles accumulated at the foot of the cliff to form the bright-colored region of the image The volcanic plains on Mars cover about 60% of the planet. It is thought that volcanism may have contributed to the formation of these features. Plain-style volcanism probably occurred throughout much of Mars’ geologic history. This can be seen in the resurfaced highland and lowland regions of the planet. To form the plains the lava flows would have probably had to have a high eruption rate. These features usually display wrinkle ridges that can be 10s km in length and 1000s m wide. Besides the large volcanoes, Mars also has many other volcanic features. The most obvious are the mare-like plains near Tharsis and the largest impact basins. However, the Viking mission found other, much smaller features as well. These include Earth-like cinder cones, a few small shields and some very old, rugged mountains in the cratered uplands. Some examples from each of these groups are shown here. This image shows a field of larger cinder cones (arrows). Each is 2-5 km in size, and they are located near the edge of the cratered uplands. Like large cinder cones on Earth, most show a lop-sided, horse-shoe like pattern. Also note the many irregular pits within this image. These may be magma drainage features or a mark of volcanically melted ground ice within the region. This image shows one likely group of small volcanic cones on Mars. The features are all less than a kilometer in size, and they are located in the northern lowlands. Each shows a clear central pit, and several lie on or along older faults (arrow). They are similar in size to Earth cinder cones, but the central pits are larger due to MarsÕ lower gravity. Like Earth cones, they mark the sites of small explosive eruptions. There are also some possible volcanoes in the cratered uplands. Because the cratered uplands are very rough, however, these volcanoes are very hard to find. This is one of the clearest examples. It is about 25 km in size, and it lies south of the Tharsis region. It is clearly an isolated mountain with an apparent (central?) caldera (arrow). It is also heavily furrowed and thus looks like a number of Earth volcanoes. The problem is that it has no clear lava flows. Thus, the inferred caldera could be just another small impact crater. Similarly, the peak itself might be just part of a very old impact crater. However, that seems unlikely in this case. Wind-blown sand and dust cover most surfaces on Mars. Thus, most of the mare-like plains on Mars show little sign of a volcanic origin. This is one of the exceptions. Shown here is a caldera located near the middle of Syrtis Major Planum. This plains unit is over 1200 km in diameter. Unlike the lunar mare, however, it does not fill the floor of a large impact basin. Rather, it covers the cratered uplands just outside the Isidis impact basin. The caldera itself is 70 km across, and several hundred meters deep. It marks the collapsed roof of an old, shallow magma chamber . To the northwest, it is surrounded by faults and graben . To the southeast, the caldera wall has been buried by younger lava plains. Note the small volcanic cone (arrow) located on the caldera floor. This image shows a small part of the Valles Marineris Canyon System. The upper half of the picture is a canyon wall. The lower half is part of the canyon floor. The band of dark splotches running through the middle is a set of minor volcanic vents. These splotches are fairly thin, and they seem to be centered on faults within the canyon wall. They are also very young. They are younger than almost every other feature in the canyons, and some may be less than 100,000 years old. Thus, they may be the youngest volcanic units on Mars. They probably mark very small pyroclastic eruptions, much like the smallest dark mantling deposits on the Moon. Io, the innermost large moon of Jupiter, is about the same size and density as Earth's Moon. Io is the most volcanically active body known in the Solar System. Eruptions are so common and so large that the entire surface can be buried under 100 meters of material every 1 million years (it takes submarine volcanoes about 80 million years to resurface about two-thirds of the Earth). Impact craters, which are common on many planets and moons, are absent on Io because of the frequent volcanic eruptions bury them. These enhanced (false) color views of Io highlight details of the surface. Some areas on Io are truly red and are closely associated with very recent explosive eruptions and volcanic plumes. The most prominent red oval surrounds the volcano Pele (far right). Galileo images courtesy of NASA's Jet Propulsion Laboratory. The following pages provide an overview of many aspects of Io's volcanoes. Io has differentiated into layers. Understanding the number and composition of the layers is still being studied. Most scientist agree there is a core surrounded by mantle . A simple 2-layer (metallic core and a silicate mantle) model suggests the core is about 17-20 percent of Io's mass and has a radius of about half of Io's radius (Anderson et al. 1996). Another model (that assumes a pure iron core) suggests the core is 11-14 percent of Io's mass and has a radius of about one-third of Io's radius. Schubert (1997) used a three-layer model to suggest the presence of a thick (100-250 km) outer layer on Io. Several lines of evidence indicate that Io's metallic core is at least partly molten. Some models call for Io to have silica-rich crust about 40-60 km thick. The crust would be made of alkali-rich minerals, probably feldspars and nepheline. Much of the mantle may be pure forsterite (magnesian-rich olivine). The enormous gravitational forces of Jupiter cause heating within Io. Most of this heating is concentrated in the asthenosphere , estimated to be 50-100 km thick. Additional heating occurs deep in the mantle. Melting is probably located at the base of the lithosphere . Based on the amounts on energy released by Io's volcanoes each part of the interior has probably been remelted at least 100 times over the satellite's history. Explosive eruptions have been observed on Io and there is indirect evidence for effusive eruptions. Galileo color images showing two volcanic plumes on Io. A plume erupting over Pillan Patera was captured on edge of the moon (see main image and inset at upper right). The plume was 140 kilometers (86 miles) high. The Galileo spacecraft will pass almost directly over Pillan Patera in 1999 at a range of only 373 miles (600 kilometers). The second plume is erupting over Prometheus, seen near the center of the moon and near the boundary between day and night and the inset at lower right. In the inset image, the shadow of the plume can be seen to the right of the vent . The plume is about 45 miles (75 kilometers) high. Two types of eruption plumes have been observed: Prometheus-type and Pele-type. Ejection velocities for explosive eruptions are estimated to be 500 to 1,000 meters per second. Plume diameters can be as much s 1,000 km. In December 1996, Pele's plume had at a height of 460 km. Most of the plume-producing eruptions are near the equator (between 30 degrees north or south). Two of the eruption sites, called Pele and Loki, are associated with calderas. Explosive eruptions can continue for at least a few days but some wane after a few hours. Sulfur dioxide gas may be the driving force of the explosive eruptions. High-resolution image of part of Io showing lava flows and other volcanic features on Io. Earth-based monitoring of thermal emissions on Io have been interpreted as eruptions of surface lava flows. In 1996, two effusive eruptions produced about 3 square km of lava at eruption rates of 10,000 to 1,000,000 square meters per second. Eruption temperatures were greater than or equal to 1130C (Strawberry and others, 1997). Eruptions on Io may produce pahoehoe and aa flows, possibly as overflow from lava lakes or from fissure eruptions. The Voyager probes obtained images of about 35% of Io at a resolution of 5 km. In some areas resolution was as good as 0.5 km. These images allowed geologic maps of Io to be constructed. Geologists could recognize mountains, plains, and volcanic vents, and the relative ages of these features. Nine eruption plumes were discovered during the Voyager 1 mission. Voyager 2 arrived four months later. Voyager 1 image taken on the morning of March 5, 1979 at a range of 377,000 kilometers (226,200 miles). Galileo was launched in 1989 and entered orbit around Jupiter on Dec. 7, 1995. Project Galileo: Bringing Jupiter to Earth describes the spacecraft, mission, images and results. Future observations: Io is the most volcanically active body in the solar system. Scientists hope to learn more about the fiery satellite when Galileo continues its studies over the next two years, during a mission extension known as the Galileo Europa Mission. The extended mission will include eight additional encounters of Europa, four of Callisto, and two close Io flybys in late 1999, depending on spacecraft health. Galileo will pass very close to Pillan Patera in the first of the two Io flybys, so high- resolution images can be acquired over a small portion of this area. The NASA Infrared Telescope Facility (IRTF), on Mauna Kea, Hawaii, collects infrared images of Io when the satellite is observable. This data set is in support of images collected during the Galileo mission. The images can detect eruptions and, under the right conditions, the active volcano . This telescope provides better time coverage and time resolution of volcanic activity on Io compared to Galileo observations. The images from the telescope have detected very hot events (>1220 C) that lasted days or weeks (Spencer and others, 1997). Some events are located at known calderas. Loki, Io's most powerful single volcano, appears to have periods of increased activity that last several months. Interestingly, not all hot events are associated with plumes or surface changes. The Infrared Telescope Facility at Lowell Observatory in Arizona has detected thermal emissions on Io caused by violent silicate eruptions, possibly from fire fountains or the overflowing of lava lakes. The Hubble Space Telescope (HST) has been used to observe Io. For example, between March 1994 and July 1995 a major brightening (eruption) was observed at Ra Patera. HST has also observed eruption plumes from Pele such as the one shown in the above image. Plume height is about 400 km. These observations allow estimates of the plume density, composition, and mass and detection of rapid changes in plumes.